Campbell, Lawrence. 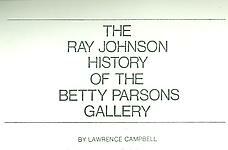 "The Ray Johnson History of the Betty Parsons Gallery." Art News 72 (January 1973): 56-57.